Ezra Hendrickson (born 16 January 1972 in Layou, St. Vincent) is a retired Vincentian footballer. He played professionally in the United States' Major League Soccer with New York MetroStars, Los Angeles Galaxy, Dallas Burn, and Chivas USA, and was also a member of the Saint Vincent and the Grenadines national team. He currently serves as an assistant for Seattle Sounders FC and coaches the club's 2nd team. Hendrickson played club soccer and varsity basketball at Western High School in Russiaville, Indiana. He then played college soccer at Drake University from 1990 to 1993, where he was named all-Missouri Valley Conference three times, and was named an NSCAA third team All-American as a senior. Upon graduating, Hendrickson joined the amateur Des Moines Menace in 1994, where he played striker, scoring 13 goals in his first year. After a season with the Menace, Hendrickson was signed to a professional contract by the New Orleans Riverboat Gamblers of the USISL. Hendrickson played for the Riverboat Gamblers, and was named Select League Defender of the Year in 1996. 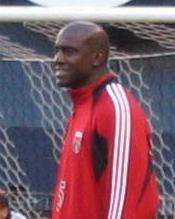 After his exceptional 1996 season, Hendrickson was drafted 5th overall in the 1997 MLS Supplemental Draft by the New York/New Jersey MetroStars, for whom he played eight forgettable matches in 1997. During his time with NY/NJ, fans gave him the nickname 'The Caribbean Beckenbauer'. Midseason, Hendrickson was cut and picked up by the Los Angeles Galaxy, where he solidified his role as a starter, and earn a reputation as one of the best wing backs in MLS. After seven seasons with the Galaxy, Hendrickson was traded to the Dallas Burn in 2003. When the Burn reorganised the team following their dismal 2003 campaign, Hendrickson found himself without a team in MLS, and briefly signed with the Charleston Battery of the A-League. However, not long into the 2004 season, D.C. United acquired him to play a backup role in their central defence. Hendrickson was selected fifth overall by C.D. Chivas USA in the Expansion Draft after the season. After a year with Chivas, he was on a move again, sent to Columbus early in the 2006 season. He retired after helping the Crew to its first MLS title during the 2008 season. 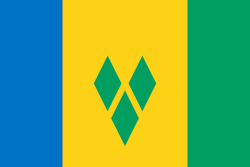 Hendrickson also spent time as the captain of the Saint Vincent and the Grenadines national team, and was one of the team's best players since earning his first cap in 1995 against Barbados. He made 24 appearances for Saint Vincent and the Grenadines in the 1998, 2002, and 2006 World Cup qualifiers and 123 overall, scoring twice during a 1996 Caribbean Cup match against Haiti on 27 May 1996. After retiring, Hendrickson joined the staff of Seattle Sounders FC, working as an assistant to his former coach, Sigi Schmid. After managing the Sounders reserves for several seasons, he was named head coach for Seattle Sounders FC 2 upon the club's entry into the United Soccer League. 1 2 "MLS veteran EZ calls it quits". FIFA. 8 January 2009. ↑ "Goals". 11 v 11. Retrieved 7 January 2015.